1 Assistant Professor at the Instituto de Altos Estudios Nacionales of Ecuador (IAEN) and the Pontifical Catholic University of Ecuador (PUCE). Email: pablo.garces@iaen.edu.ec, pfgarcesv@puce.edu.ec. Intergenerational mobility has been studied from two broad perspectives, namely, monetary and non-monetary. The dominant framework by far has been the former. However, it is not evident that monetary approaches are supe rior to non-monetary ones. In fact, in several respects, the latter shows clear advantages over the former. Hence, this article exposes the virtues and short comings that they have on each of the main stages relevant to the conduct of inquiry: conceptualization, data collection, and data analysis. This scrutiny suggests that monetary methodologies privilege parsimony over realism, while non-monetary methodologies do the opposite. In this context, it is argued that moving from elegance (parsimony) to realism is required in order to account for the actual complexity of socio-economic intergenerational mobility. JEL Classification: I31, I32, I39. La movilidad intergeneracional se ha estudiado desde dos perspectivas: mone taria y no monetaria, siendo la primera el acercamiento dominante en la literatura. Sin embargo, no es evidente que acercamientos monetarios sean superiores a los no monetarios. De hecho, en varios aspectos, estos muestran claras ventajas sobre aquellos. Consecuentemente, este artículo expone las virtudes y limitaciones que tienen en las principales fases de la investigación: conceptualización, colección o levantamiento de información y análisis de la información. Este estudio sugiere que las metodologías enfocadas en lo pecu niario privilegian la parsimonia sobre el realismo y que las no monetarias hacen lo opuesto. En este sentido, este trabajo argumenta que el movimiento de la elegancia (parsimonia) al realismo es necesario para dar cuenta de la comple jidad de la movilidad socioeconómica intergeneracional. Clasificación JEL: I31, I32, I39. Inequality has gained great importance in the international academic and political agenda in recent years (e.g. Atkinson, 2015; Piketty, 2015; Stiglitz, 2013; UN, 2013). Its impact on economic and social outcomes (Chang, 2013) and its scandalous and worsening levels (Peet & Hartwick, 2009) justify this attention. Nevertheless, there are a few questions that are yet to be answered. The scholarship suggests, for instance, that the issue is not how to achieve complete equality, since this can be socially undesirable (Chang, 2013), but which level of inequality is acceptable. More importantly, and prior to the latter, there is no consensus on the dimension on which inequality is to be debated. While conventionally the focus has been on monetary indicators (income and perhaps wealth), critics have opted for non-monetary indicators (e.g. occupation and education). Additionally, whatever the dimension may be, the debate has also questioned whether equality of outcomes or equality of opportunity is of interest. In this sense, to address these (normative) questions, complementary analyses focusing on change are required. Inequality entails a non-equal distributional scheme of a (valued) good. Studying it, particularly for normative exercises, requires more than the observation of breaches and gaps in a given distribu tion. It can be fruitfully informed by the study of the degree with which indi viduals in society can change their relative position. This deceivingly simple notion entails two rather complex and interrelated elements: i) mobility; and, ii) agency. The first denotes the extent to which individuals move from one rung of the ladder to another (not necessarily the next immediate one). This is the observable result. The second refers to the extent to which the movement from one rung to another depends exclusively on the individual or if it can be attributed to factors beyond their control such as their background. This can be considered the determinant of the result or the means to the end. As such, the role of family has come to the fore, giving relevance to the analysis of intergenerational mobility. Hence, this paper addresses intergenerational mobility and argues that what ought to be privileged is “realism above elegance, and relevance and suffi ciency above precision” (Gasper, 2008, p. 252). With that aim in sight, it makes the case for the study of intergenerational mobility via a social non-monetary approach instead of an exclusively monetary one; i.e. the dominant approach. In this undertaking the first section presents the place and relevance of the topic within the broader literature on equality. The following three sections dis cuss the advantages of non-monetary approaches over monetary ones related to the arguably three main fields of scientific inquiry: conceptualization, data collection and data analysis, respectively. The final section concludes. Inequality, arguably regardless of the specific dimension (e.g. income, wealth, education), has received increasing attention by academics and policy makers the world over. Most economic analyses rely on the assumption that equality on these dimensions is a desirable social objective (Lefranc, Pistolesi & Trannoy, 2009). Nevertheless, theoretically and empirically there is support for some level of inequality by scholars and the public alike (Kelly & Evans, 1993). Con sensus, however, has proven most difficult regarding its actual extent. Different societies favor different notions and degrees of inequality. There is diversity in the kind, i.e. the space on which it is to be assessed, as well as the magnitude of equality that is deemed desirable, or at any rate acceptable among soci eties. For some, such as the United States, relatively high levels of inequal ity may be acceptable if moving up from low quintiles to higher quintiles in the distribution is possible (and plausible), whether for the individual or their progeny (Chang, 2008). This is the well-known “from rags to riches” narrative. Conversely, other societies may be more intolerant of certain levels of inequal ity and therefore have established mechanisms in order to reduce it to a level they consider acceptable, even if upward mobility is also possible and desir able. The creation of welfare states like Germany and Sweden illustrates this preference to a large degree. Regardless of those preferences, the importance of being able to move up the distributional rungs of what is deemed valuable, especially from those located at the bottom, is well accepted, whether it is performed by an individual over their lifespan or by their offspring. Conse quently, the discussion regarding (the study of) inequality is greatly informed by the incorporation of mobility in general. The discussion so far refers mostly to the dominant study of inequality; that is, the distribution of income (or wealth). In the relevant literature, this is referred to as a focus on individual outcomes. Consequently, studies focused on pecuniary indicators are considered to focus solely on what has been called inequality of outcome (Lefranc, Pistolesi & Trannoy, 2008). The debate regard ing inequality has increasingly shown a move from outcomes to opportunities (e.g. Cohen, 1989; Dworkin, 1981a, 1981b). This entails acknowledging that outcomes depend on a myriad of factors, many of which are in the control of individuals, and many others that are not. In this context, attention to oppor tunities means differentiating between aspects for which a person is respon sible and those for which they are not. Hence, equality of opportunity entails a focus on structural aspects or the conditions that can enable individuals to flourish by exercising their agency, or the aspects for which a person can be held accountable. By so doing, individuals are treated as agents, that is, as having at least some command over their destiny (Le Grand, 2003; Sen, 1999). Accordingly, individuals are regarded only as partially liable for those out comes. That being so, outcomes are also regarded as the product of circum stances outside the control of individuals. Therefore, there is a recognition of the importance of personal responsibility when debating equality, which car ries normative implications. From this perspective, public policy should only seek to address and compensate inequalities stemming from factors beyond the scope of human agency and individual responsibility. This, according to Roemer (1998), encompasses two elements: i) what is referred to as “level ling the playing field”; and, ii) the non-discriminatory principle, which simply means that any factor other than merit should not affect access to any posi tion. Thus, the distinction has been made between those aspects for which an individual is held accountable (by society), referred to as effort, and those for which they are not, known as circumstance1 (Roemer, 2002; Roemer, 1998). One factor that has received increasing attention in this regard, as pertaining circumstance, is family (Roemer, 2002). Hence, intergenerational mobility in particular can provide valuable insights into this literature. Thus, whether it is equality (or inequality) of outcome or opportunity, intergen erational mobility constitutes an enlightening and complementary instrument to its analysis. In this sense, “‘generational mobility’ refers to the relationship between the socio-economic status of parents (…) and the status (…) their children will attain in adulthood” (Corak, 2004, p. 3). It seeks to evaluate the extent to which the adult outcomes of children are tied to a given endowment or family background. In other words, it is the assessment of how much certain family characteristics influence the prospects of the offspring. An authorita tive document by the OECD (2010, p. 184) states: “Put differently, mobility reflects the extent to which individuals move up (or down) the social ladder compared with their parents. A society can be deemed more or less mobile depending on whether the link between parents’ and children’s social status as adults is looser or tighter.” What seems to be of interest in this discussion ultimately is well-being and unraveling how the well-being of children is tied to that of their parents. In this undertaking, the study of intergenerational mobility (IM) has focused notably on two main broad areas: economic as well as social intergenera tional mobility. The former has privileged the use of monetary indicators such as income and wealth, and has focused on their distribution in society. The attention to monetary indicators responds to the utilitarian notion of well-being that associates earnings with consumption and the latter, in turn, with higher utility levels (McGillivray, 2007). Social intergenerational mobility, conversely, has favored richer variables such as occupation (and education) and has used class based schemes for its analyses. These indicators are used because they arguably capture the same information as the monetary ones, but also include some additional indicators. As such, both approaches share the assumption that their variables of interest capture (the most) meaning ful information about people’s lives.2 Nevertheless, as it is detailed below the differences seem to outweigh their coincidences, rendering the selection of one over the other as a consequential exercise for policy making. Against this backdrop, the advantages of one over the other will depend on a choice between parsimony and realism. (…) if an underlying idea has an essential ambiguity, a precise for mulation of that idea must try to capture that ambiguity rather than attempt to lose it. Even when precisely capturing an ambiguity proves to be a difficult exercise, that is not an argument for forgetting the complex nature of the concept and seeking a spuriously narrow exact ness. In social investigation and measurement, it is undoubtedly more important to be vaguely right than to be precisely wrong. Measuring IM with monetary indicators such as income and wealth has advantages and disadvantages. Income can significantly inform the study of IM. For example, children’s human capital depends on their parents’ invest ments, which can depend to a great extent on income (Corak, 2004). Conse quently, higher income of the parents may be translated into more investment in their children and better results in terms of human capital, which, in turn is likely to improve their chances when it comes to accessing labor with higher wages. That is, higher income from parents can translate into higher income for their children. However, the monetary focus may have some limitations. First, the income of the parents may not be the only relevant variable to account for the outcomes in the income of children. Although the decision between current consumption and investment corresponds to the parents, other factors (e.g. education of the parents, family structure) may play a non-negligible role. Similarly, income alone fails to capture significant factors such as non-pecuniary rewards derived from labor (Hauser & Warren, 1997), such as prestige, and other rewards from non-labor activities, e.g. self-esteem. Moreover, the monetary variable that should be discussed as income can be defined in different ways. Most often, it refers to labor market earnings. This definition is, however, not unproblematic. It excludes at least two rather rel evant categories, particularly in developing contexts: those who work with no monetary compensation, and those who work and get a compensation but not in a way accounted for by the market. The latter is illustrated by self-em ployment (Björklund & Jäntti, 2009). The former, is perhaps best exemplified by what is known as the economy of care; i.e. those activities carried out by family members (most often women) which otherwise are paid and accounted for by the market, such as nursing and babysitting. Additionally, and impor tantly, this variable is usually collected at the household level, which implies limitations regarding the distribution of income within the household. This means that differences in income earning between parents are obscured as explanatory factors. Furthermore, individual differences between children and other non-income earning family members are also omitted, failing to recog nize their particular needs. In this context, disposable income, including in-kind transfers and equivalence scales, could arguably be a superior indicator. However, even this concept presents difficulties given that IM in terms of disposable income might reflect the transmission of family structure and income (Björklund & Jäntti, 2009). Similarly, it does not fully solve the problem of heterogeneity within the house hold. Therefore, income is more likely to capture, at most, economic mobil ity (and even this can be contended), which is only a part of social mobility. Wealth (net worth), an important component of well-being, could be regarded as an alternative. Although both are monetary indicators, and despite popular belief, income and wealth can in fact be weakly correlated3 (Keister & Moller, 2000). Interesting paradoxes illustrate this state of affairs. It can be the case that families with low income can live comfortably from assets (income poor, but wealth rich), while families with high income may struggle to make ends meet due to sufficiently high negative assets, i.e. debts (income rich, but wealth poor). Thus, parents’ wealth can also affect their investments in their children, thereby impacting their human capital and their adult outcomes. Furthermore, wealth could tell a richer story given that it seems to compen sate for some of income’s shortcomings in the study of IM.4 Meaningful advan tages are associated only with wealth ownership. Wealth can, for example, provide short and long-term financial security as it 1) constitutes a resource with which to smooth consumption in times of need, 2) bestows social pres tige given that certain assets, such as real state and vehicles, may be highly regarded socially, 3) furnishes political power, and 4) produces more wealth (Keister & Moller, 2000). Consequently, it would seem that wealth encompasses better than income the factors that children may inherit from parents. Nevertheless, despite their dif ferences, both indicators share at least one significant limitation, namely, the scope of application. Specifically, the extent to which wealth actually captures non-economic factors, but relevant elements in the study of IM nonetheless, remains an empirical question. Therefore, although potentially a better indi cator than income, wealth ultimately also falls short of encompassing non-economic mobility5 and providing thereby a more realistic account of it. Regardless of the pecuniary variable, when it comes to intergenerational mobility, as defined above, the conceptual discussion boils down to what is actually regarded as socio-economic status and to what extent the selected approach can capture it. In this sense, a monetary approach seems limited. Socio-economic status explicitly goes beyond exclusively economic variables, recognizing the shortcomings of the conventional one dimensional approach. Socio-economic status arguably seeks to capture a rich notion of well-being, whereas a focus on monetary variables, whatever it may be, reduces it to well-off, confusing well-being with well-having (Sen, 1985). The focus on monetary indicators is not unbiased. “We see the world through lenses, not only shaped by our ideologies, but also shaped by the statistics we use to measure what is going on; the latter being frequently linked to the former” (Stiglitz, Sen & Fitoussi, 2010, p. xix). Consequently, the dominance of the statistical template influences the choice of indicators. The virtual supremacy of conventional quantitative methods favors the operationaliza tion of concepts by indicators that capture them by a sufficient degree of exactness and precision. This is of the utmost importance because indicators point to what matters. Thus, money centered approaches convey the idea that what matters is income and wealth, or simply money. As mentioned above, the argument behind this notion, at least with the focus on income and (even more so) consumption, is that they are the closest to the utility function (McGillivray, 2007) and, for utilitarians, this is as close as a measurement of well-being can get. Conse quently, it regards monetary variables and indicators as ends in and of them selves; that is, as having intrinsic value. Presumably, it is because of this that, as mentioned earlier, a focus on measures of opulence is regarded as a focus on outcomes. However, they may be better regarded as focusing on path ways, when studying well-being. This is because, as Sen (1999) has convinc ingly argued, income or wealth have only instrumental value. They are only good for other intrinsically valuable things that they allow people to achieve. In this sense, there is a long tradition (dating from and carrying the pedigree of Aristotle until current scholars such as Amartya Sen) that recognizes the value of money, but only instrumentally; i.e. it is only a means to obtain certain ends. Therefore, instead of emphasizing the means, it instead focuses on the ends them selves; i.e. goods with intrinsic value that directly reflect people’s quality of life. Indeed, above and beyond monetary variables, there is a multiplicity of factors that i) can capture how well future generations do; and, ii) can influence how well a generation does. In both cases, many of those factors are intrinsically valuable (e.g. education, health). Within the relevant literature, occupation and education seem to occupy a privileged place as non-monetary indicators. Occupation is relevant because job holding is arguably the most important role held by adults outside their household; it defines the skills they possess as well as their present and future prospects; it allows the characterization of individuals in terms of their cur rent or past job, which, if well described, can provide more information about economic and social standing than monetary indicators (Hauser & Warren, 1997). Therefore, occupation status encompasses a wide array of factors, although certainly not all, regarded as intrinsically valuable by a society, that is, by others as well as the self. Being able to stand in public without shame is one such intrinsically valuable factor or, as it is referred to in the relevant lit erature, a functioning that people have reason to value (Sen, 1999), that can arguably accompany occupation status but does not necessarily follow from command over economic resources. Thus, if aspects such as the social standing and esteem are regarded as meaningful to an individual, not only because of their instrumental value, but also because of their intrinsic importance, then non-monetary variables ought to be factored in the analysis. Consequently, occupation entails factors that can greatly contribute to the study of IM. By doing so, it provides an account of positions within a social (as opposed to an income or wealth) distribution. Apropos education (educational attainment), it also enjoys advantages over monetary indicators. Education constitutes part of the human capital invest ment to which monetary indicators are associated. This signals a move from indicators that have exclusively instrumental value to those that have (in addi tion, and more importantly) intrinsic value (Sen, 1999). This entails a move from means to ends.7 Furthermore, a growing body of research shows that higher education is related to higher earnings, better health and longer life (Black & Devereux, 2011). These are valued factors in society that can determine the status of individuals and, as such, are all relevant elements in IM. Indeed, occupation indicators often have elements of education inbuilt in them in a variety of ways to construct classes (see e.g. Ganzeboom, DeGraaf & Treiman, 1992). This is perhaps best exemplified by Erikson and Goldthor pe’s (2002) Class Scheme and Wright’s (1985) Class Typology (see Table 1). Although each framework focuses on distinctive elements, according to the purposes of the authors, both seem to share the incorporation of education (often in the form of cognitive skills entailed by their labor activities) in their analyses in order to design their approach to classes. Source: Hauser and Warren (1997). Consequently, individually, and especially in tandem, non-monetary indicators seem to account for the complexity and multidimensionality of IM in a much richer manner than monetary ones, at least conceptually. How they perform in practical terms, dealing with data related matters, is the issue I take up next. From theory to praxis, measuring IM presents interesting challenges. This enterprise is data demanding given that it requires the collection of evidence at comparable points of the life cycle among different generations. Scholars (see Atkinson, 1980; Corak, 2004; Hauser & Warren, 1997) point to at least two main ways in which this can be done: i) longitudinal study; and, ii) ret rospective accounts. Below, each is analyzed. Data about monetary indicators is notoriously difficult to collect, particularly in light of the fact of its demand for precision. In the case of longitudinal surveys, when panel data is available, specific limitations apply. Such type of data can be particularly subject to attrition; e.g. subjects dropping out from the survey (Neri, 2008). This may distort the sample and compromise the study. When this data is not available, cross-sectional data has been used; e.g. household sur veys. These, however, are imperfect instruments (Bound, Brown & Mathiowetz, 2001) and potentially inaccurate sources of information regarding income. For example, imputation can be difficult, requiring the disaggregation of the sources of income; recall bias can occur (voluntarily or involuntarily) affected also by the tendency to over- (or under-) state certain events in detriment of others; and, results of the survey can be affected by factors such as seasonality (Deaton, 1997). Further, for some respondents, at different moments (e.g. the recently unemployed), giving an income estimate may be a discrete issue and therefore inaccurately responded (Bound et al., 2001). The importance of the above is exacerbated by the fact that IM requires rather accurate estimations of long-run (i.e. lifetime) income of two generations because current income is subject to temporary factors (Björklund & Jäntti, 2009). Similar limitations apply to wealth, and in some cases they can be more perva sive. Underreporting significantly affects the evaluation of households’ finan cial wealth. This affects total financial assets directly, but given the fact that underreporting is likely to have a random component, it can affect mobility as well by dint of the introduction of spurious changes (Neri, 2008). Like income, the rate at which wealth rises and falls varies across a number of factors, and its measurement is increasingly difficult and unreliable at high wealth levels (Shorrocks, Davies & Lluberas, 2011). Regarding retrospective accounts, these exercises entail asking the adult off spring about their parents’ income or wealth when they were children. Thus, they are subject to similar issues as household surveys, most notably recall bias (Atkinson, 1980). As mentioned above, the unreliability of the data can be even greater in the case of wealth. Beyond these limitations, these types of accounts can be prohibitively expensive, and thus, not very representative. This is a great hindrance in a subject matter that, by its very nature, aspires to a considerable level of generalization or external validity. Therefore, in practical and methodological terms (the latter to a large extent is due to the former), retrospective accounts constitute a rather suboptimal alternative for monetary data collection. Hence, whether with longitudinal, cross-sectional surveys or retrospective accounts, the trade-off between accuracy and representativeness is evident when using monetary indicators. It ought to be mentioned, however, that inno vative options such as using administrative data have been explored as alter natives (Corak, 2004). The latter, in the limited countries where it is available, constitutes a promising avenue to be developed. This notwithstanding, the jury seems to still be out in terms of the extent to which these novel techniques are able to adequately tackle the aforementioned trade-off. Non-monetary measures present a more sanguine panorama regarding data collection. Whether in longitudinal or cross-sectional surveys, rates of refusal and non-response to non-monetary questions are rather low (Hauser & War ren, 1997). At any rate, they seem to be lower than in the case of monetary questions. Concerning occupation, it is easier for respondents to describe their jobs and those of their parents, and to trace occupational trajectories through out time, than it is to provide reliable analogous information about income or wealth (Hauser & Warren, 1997), regardless of the type of survey (longitudinal or other). Moreover, given that much can be inferred about socio-economic standing from occupational information, this data is not only accurate,9 but also comprehensive for the measurement of IM. Other non-monetary variables show similar advantages. In the case of edu cation, unlike monetary indicators which ideally require lifetime data, most people complete their education in their early twenties and this analysis can be carried out early in their life cycle; non-employment causes no difficulties and measurement error tends to be much less given that individuals know their educational attainment (Black & Devereux, 2011). On the flip side, these advantages come at a cost since collecting and coding non-monetary data are time and effort demanding activities. Thus, moving from monetary to non-monetary indicators relocates the cognitive burden from the respondent to the data collector (Hauser & Warren, 1997). This may affect costs and therefore also the external validity which can be expected. Additionally, unlike monetary measures, retrospective data collection has proven to be effective in the case of occupation (Atkinson, 1980) and social class (Björklund & Jäntti, 2009). Respondents know enough about the non-monetary indicator for the analyst to locate their position in the relevant dis tribution. Nevertheless, as in the case of monetary variables, it ought to be stressed here as well that this instrument is rather expensive, regardless of the data being collected. This may reduce the scope of application and take a toll on representativeness. Thus, retrospective accounts for non-monetary data constitute a more reliable instrument, although not greatly more viable, than in the in case of monetary indicators. Consequently, although more demanding for the researcher and facing some challenges themselves, non-monetary indicators seem to overcome some of the limitations and have a superior performance on complexity and repre sentativeness than monetary indicators. Certainly, by design, surveys face the tension between accuracy and large samples (Chesher & Schluter, 2002), two relevant elements in IM (Corak, 2004), but non-monetary indicators seem to perform much better against this trade-off. As in the sections above, at the level of data analysis there are important dif ferences between monetary and non-monetary indicators for the study of IM. However, there are also commonalities that need to be recognized. Both com monalities and differences are related to the type of measurement in which the indicators are expressed, namely, continuous or categorical. While eco nomic variables are located under the continuous label, non-economic ones, although they can also be expressed by continuous indicators, in this discus sion, the advantages of using categorical ones are advanced10. Regarding data handling, monetary indicators, being continuous measure ments, have at least two main virtues: one descriptive and one analytic. First, they are amenable to very fine and detailed differentiations throughout the whole data set. This is due to the fact that, because of their nature, pecuniary variables have the highest level of information (given that they can be inter val and/or ratio variables, depending on the treatment given to them). This means that there is the same difference between contiguous values regardless of the point on the distribution on which they may find themselves (interval measurement) and that there is a true zero, i.e. the absence of that which the indicator seeks to capture (ratio measurement). Therefore, monetary vari ables allow for an unlimited number of graded distinctions between positions within a distribution. Second, they allow the capturing of significant variation between positions in a distribution within one dimension, thereby facilitating their representa tion in statistical models by a single parameter. Tools frequently used in this regard have been correlations, regressions (the workhorse of the statistical toolbox [Moses & Knutsen, 2012]) and elasticities. Hence, economic mobility, measured via correlations and regressions, leads to results that can be con cisely expressed (Erikson & Goldthorpe, 2002). This means that in one exercise, and with one coefficient (or perhaps a couple, given the relevance that statis tical significance has in statistical exercises), the researcher can summarize great amounts of information and thereby facilitate the inferences that can be made from large numbers of observations. Incidentally, the inquiry of IM is frequently characterized by large data sets (which is what makes it amenable for statistical models in the first place, due to the need of the latter for suf ficient observations to secure enough degrees of freedom). Additionally, and related to the above, monetary indicators enable the analysis of multivari ate exercises (Ganzeboom et al., 1992). Certainly, this enriches the scope and variety of analyses that can be carried out with these data, while maintaining the same virtue: summarizing and/or expressing in a few coefficients rather large amounts of information and the results of rather complex operations. Non-monetary indicators can be approached in different ways, which may affect their contribution to the study of IM. The literature points to a differ ence between categorical and continuous approaches (particularly in the con text of occupation). Continuous approaches refer to a hierarchical treatment of occupational or educational stratification. As such, they share the advan tages and limitations mentioned above in the monetary indicators’ section. That is, they allow for an unlimited number of graded distinctions between occupational groups, and they assume that differences between groups can be captured in one dimension which can be represented by a single parameter, making it amenable to multivariate analyses (Ganzeboom et al., 1992). These benefits may put non-monetary indicators on par with monetary ones in terms of data analysis, at least when it comes to the former being operationalized as continuous variables. However, in the case of non-monetary indicators these characteristics, particularly the last one, entail a considerable loss of infor mation. Furthermore, these approaches cannot account for immobility given that they necessarily treat it as just another type of mobility, i.e. zero differ ence between origins and destinations (Ganzeboom et al., 1992). Categorical approaches, in turn, refer to the treatment of occupational and educational stratification in terms of classes (see Erikson & Goldthorpe’s Class Schema and Wright’s Class Typology in Table 1). People are assumed to belong to a limited number of discrete categories, which are internally homogeneous and externally heterogeneous, an assumption supported by empirical evidence (Ganzeboom et al., 1992). These approaches utilize transition matrices in lieu of correlations, regressions or elasticities and use a rich variety of parameters to characterize a distribution. This is related to another virtue of categorical approaches, namely, the fact that their stratification processes are multidi mensional in nature (Ganzeboom et al., 1992). Significantly, this multidimensionality is different from that suggested in recent contributions, like Sen’s, which has been referred to in this article. The Human Development and Capability Approach has emphasized the importance of expanding the informational base on which assessments of well-being are based (Alkire & Deneulin, 2010; Sen, 1999). In this sense, the case is made for a multidimensional approach to the study of achievements and freedoms (Alkire, 2010; Comim, 2008). Empirically, this has conventionally been operational ized as a complex indicator, the best example of which is perhaps the Human Development Index, which consists of the dimensions of health, education and standard of living (Klugman et al., 2011). That is, each meaningful dimension is captured by an indicator (or a couple of indicators) and then all dimensions are aggregated into a complex index. In this sense, despite Sen’s valuable concep tual contribution, applications of the approach have been dominated by con ventional economics and, hence, have mostly followed the approach based on the statistical template and traditional quantitative methods, focused on the pursuit of exactness and precision11. Contrary to this alternative, the one suggested here advocates a rather socio logical approach that encompasses various dimensions within one category. Therefore, the differentiation becomes evident. Categorical approaches rec ognize that human experience is multidimensional but address multidimen sionality in a distinct manner. The categories proposed provide an account of various dimensions without seeking to capture each one individually with mathematical precision. Additionally, those categories can account for phenomena that continuous approaches cannot; e.g. the disproportionate segment of the population who remains in their parents’ class; and, mobility regimes across class structures (the assumption that the associations between class of origin and class of destination may vary across the segments of the population from one inter generational transition to another). In this sense, class can be conceptually more meaningful than a quintile or a decile, or any other equidistant segment in a distribution. Consequently, by using non-monetary categorical indicators in the measure ment of IM, what is lost in parsimony is gained in realism. If this is the price to pay, it seems to be a bargain since “policy debates have indeed been distorted by overemphasis on income poverty and income inequality, to the neglect of deprivations that relate to other variables, such as unemployment, ill health, lack of education, and social exclusion” (Sen, 1999, p. 108). This, in turn, is a reflection of the academic debate itself, to the extent that much of the research carried out in the field of development seeks to induce practical consequences (Mehta, Haug & Haddad, 2006). Therefore, it becomes all the more necessary to provide alternatives to the dominant approach, particularly when its limi tations can have rather considerable repercussions. It should be remembered that if the approaches and indicators that countries use fail to conceptualize and measure human well-being correctly, the policies they inspire may well hit the target but miss the point. “Inequality matters” (UN, 2013) and it must be taken seriously. This means recognizing its complexity and the challenge this entails for research, which leads to critically acknowledging the virtues and also the limitations of differ ent approaches to study equality, particularly those conventionally used. This paper seeks to contribute in that regard and argues for the use of comple mentary analyses above and beyond the observation of distributions of pecu niary variables. Due to the normative nature of the issue, attention ought to be given to change. In this sense, a case has been made in favor of informing the discussion on inequality by the introduction of two aspects: mobility and agency, through the study of intergenerational mobility. At the same time, because of its normativity, the difference between a focus on the means and one on the ends of well-being has also been discussed. Moreover, given that “the theories we construct, the hypotheses we test and the beliefs we have are all shaped by our systems of metrics” (Stiglitz et al., 2010, p. xix), the argument elaborated above has endeavored to flesh out the implications of two approaches to the study of IM, conceived of precisely in terms of the ontological units they focus on. Thus, intergenerational mobility can be approached in at least two broad ways: by the use of monetary and non-monetary indicators. Despite the advantages of the former, which is by far the dominant approach in this area, this paper has sought to show the latter’s advantages for the analysis of intergenerational mobility. This conclusion is derived from a threefold analysis. Conceptually, while monetary indicators seem to capture one dimension - economic mobility, which is only instrumentally valuable, - non-monetary indicators do a better job at encompassing the inherent complexity and multidimensionality inher ent in human experience in general and implicit in IM, in particular, by focus ing on aspects that have intrinsic value. In terms of data collection, although both types of indicators face the trade-off between accuracy and represen tativeness, essential to IM, the limitations of monetary indicators seem to be greater. Because of the richness of the data, it must be mentioned that the burden of work falls on the researcher, as opposed to monetary approaches, which place the burden on the subject. Finally, regarding data analysis, (cat egorical) non-monetary indicators seem to better explain phenomena relevant to IM such as immobility and mobility regimes. To be sure, the non-monetary indicators have some shortcomings of their own. However, many of them depend on the lenses with which they are analyzed. From a conventional perspective, based on the statistical template and the pursuit of exactness, which eventually leads to the quest for parsimony, there may be more limitations than advantages. However, this article has argued that, although these lenses might be useful in some endeavors, when it comes to intergenerational mobility, realism seems to be a more fruitful bet. Hence, non-monetary indicators are to be privileged in the analysis of inter generational mobility to the extent that realism is favored over parsimony. And realism is of particular importance for policy making. Elegant models can be quite helpful to inform public policy, especially when other superior alter natives are absent. In the study of IM, however, there is such an alternative, as has been argued above, and it is one that policy makers would do well to explore further, since, when dealing with complex or vague issues, it is more adequate to be roughly right than precisely wrong. Although this article was not part of any specific project and therefore received no particular funding, it was written in my capacity as faculty member at the Instituto de Altos Estudios Nacionales of Ecuador (IAEN) and the Pontifical Catholic University of Ecuador, so I am thankful for the support provided by both institutions. This paper builds upon ideas and other papers originally writ ten while studying at the London School of Economics; I am therefore also thankful to the professors and peers there for interesting discussions. 1Regarding the difference between equality of outcomes and opportunities, Roemer (2002, p. 457) posits that “(…) equality of opportunity finds no moral bad in inequality of final condition across individuals ascribable to differential effort. In this way, it differs from the equality-of-outcome ethic”. 2The commonality is the one dimensional approach to measuring well-being. For a brief overview of the limitations of this assumption on one-dimensional measures of opulence in the study of well-being, see e.g. Harkness (2007) and Dowrick (2007). For a brief comparative analysis between them and the multidimensional indicators of development and well-being as suggested by the Capability Approach, see e.g. Sen (1999), Klugman, Rodriguez & Choi (2011) and Garcés (2014). 3Different empirical studies show a correlation between 0.26 and 0.5 (Keister & Moller, 2000). 4Empirically, wealth and income have shown quite different behavior regarding mobility. For example, a study carried out by Jianakoplos & Menchik (1997) shows that there is greater persistence within the wealth distribution than within the distribution of income. 5More broadly, there is an increasing body of literature that criticizes the focus on monetary indicators as, among other similarly powerful arguments, they are only means while the quality of life of people are the ends (see e.g. Alkire, Qizilbash & Comim, 2008; Nussbaum, 2011; Sen, 1999; Ul Haq, 1995). 6According to Roemer (2004), the influence of parents occurs at least through four channels, namely: pro vision of social connections; provision of beliefs and skills through family culture and investment; genetic transmission of ability; and, formation of preferences and aspiration. Discussing these channels, especially the last one, warrants using non-monetary indicators (Erikson & Goldthorpe, 2002; Roemer, 2004). 7This move from means to ends is argued in terms of people’s quality of life (Sen, 1999; Nussbaum, 2011). From this perspective, money is only important instrumentally as it facilitates obtaining intrinsically valued goods (e.g. health, education). Therefore, this is not to be confused with the previous discussion on equality of outcomes as that which focuses on monetary indicators because the latter only refers to the epistemological choice which naturally leads the analysis to the study of distributions as heuristic tools for final states. 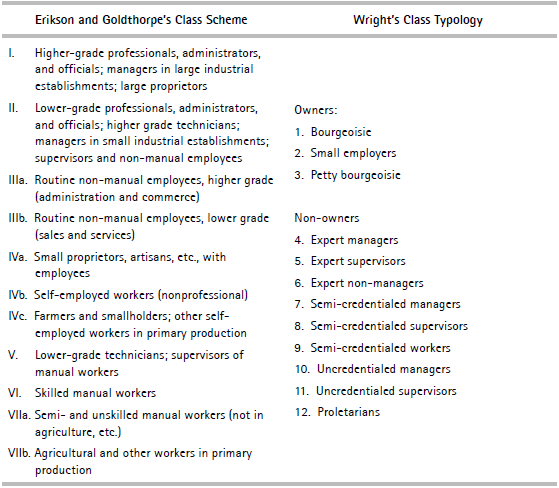 8Whereas Wright’s (1985) typology is a mixture of concepts of ownership, authority and expertise, Erikson and Goldthorpe’s (2002) scheme is a description of occupational categories based on information about employment. 9In this discussion, ‘accurate’ does not necessarily mean the same as ‘exact’ or ‘precise’, which are the characteristics valued by statistical tools, and quantitative methods more broadly, on which the monetary approach is based. Rather, the term is used in the sense of ‘better capturing reality’, and given that, as has been argued above, reality is complex and ambiguous; this alternative captures that complexity and ambiguity more accurately than monetary indicators can, precisely because they give up on the pursuit of exactness and precision. 10This answers to a twofold reasoning. First, by addressing continuous indicators in the discussion regarding the monetary approach, their virtues and shortcomings, when used for non-monetary measures, are also addressed. Therefore, it would be redundant to provide such an account for the latter. Second, and more importantly, following the argument developed in this paper, categorical variables, by definition give up on an intention to achieve mathematical exactness and precision. Therefore, focusing on them seems more adequate if what is of interest is realism. 11The same can be argued in the case of more recent contributions related directly to psychological dimensions of well-being (see e.g. Mullainathan & Shafir, 2014).